Jakarta: Indonesian entertainers have rallied against a draft law that seeks to ban blasphemous and "pornographic" music content, which critics say could be used to clamp down on freedom of expression in the Muslim-majority nation. 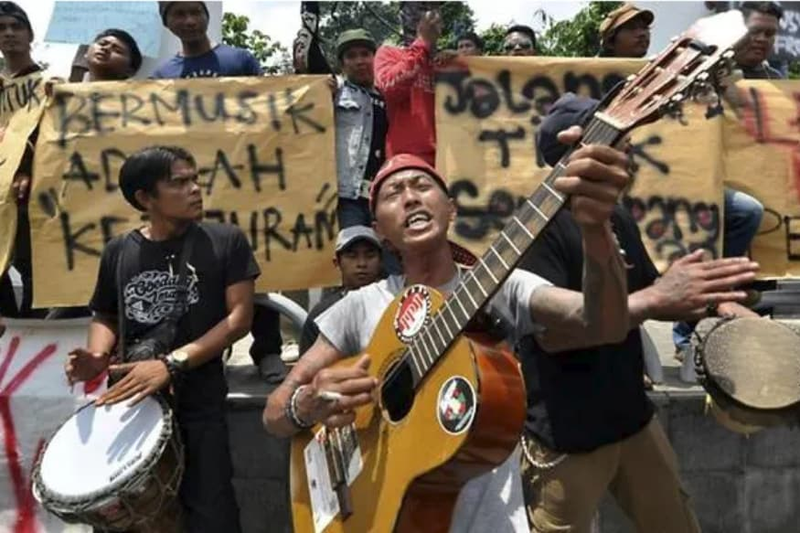 More than 100 protestors - many carrying placards or playing guitars and drums - took to the streets of Bogor, near Jakarta, on Sunday to demonstrate against the proposed law. Under the proposed law, musicians would be prevented from "bringing negative influences from foreign cultures and/or degrading human dignity" in Indonesia. As well as cracking down on blasphemous and "pornographic" content, it imposes onerous new requirements on musicians, such as carrying out competency tests to gain certification. Danilla Riyadi, who initiated the petition on behalf of a coalition of concerned musicians, said the bill is "very dangerous and could be the gateway for a group of people to persecute the creative process of people they dislike." Musician-turned-politician Anang Hermansyah, who is on the committee that drew up the bill, has been quoted as saying the goal was to strengthen Indonesia's entertainment industry and that the details could still be changed. It is not clear why the bill suggests banning foreign influences and "pornographic" content - or what would be classified as pornographic content in music. Almost 90 per cent of Indonesia's more than 260 million people identify as Muslim but the vast majority practise a moderate form of the religion. However, foreign artists have occasionally found themselves in the cross-hairs of religious conservatives or fallen afoul of the country's censors. Pop star Lady Gaga cancelled a concert in 2012 because of security concerns after Islamist hardliners promised "chaos" if she entered Indonesia.